The annual EAT! 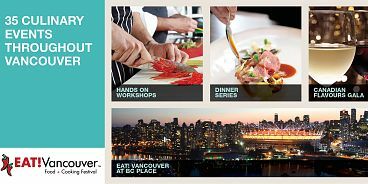 Vancouver Food + Cooking Festival returns for its 13th year April 26 to May 3, 2015 with an expanded content program featuring a smorgasbord of exciting new events that will showcase the city’s unique culinary culture and attract top chefs, food producers and consumers from across North America. Produced by Fulcrum Events Inc. and presented by Flavours Magazine, the 2015 edition of EAT! Vancouver will grow from what has been a weekend event into a week-long culinary spectacle taking centre stage at various marquee venues throughout the city before culminating in a three-day tasting show at BC Place Stadium. A Hospitality Symposium bringing together leading culinary influencers to discuss the issues facing sustainability and ethical meats. An On-site Legacy Liquor Store, where visitors can purchase their favourite beer, wine and spirits sampled at EAT! Vancouver at BC Place to enjoy at home. Returning to the EAT! Vancouver at BC Place schedule are such popular events as: The Celebrity Chef Stage; Cheese Tasting Seminars presented by The Dairy Farmers of Canada; The World Culinary Travel Expo; hands-on Culinary Classes presented by the Pacific Institute of Culinary Arts; and a selection of “Bites” featuring cuisine from around the world by local Vancouver restaurants. Wine, beer and spirit connoisseurs will also have plenty to quench their thirst at “Sips”, where attendees can engage with experts, vintners and producers from British Columbia and around the world, as well as the Sips Stage, which will offer seminars, cocktails, food pairings and wine and beer tastings presented by culinary and mixology experts. Tickets for all EAT! Vancouver Food + Cooking Festival events go on sale March 5. Full programming details and complete list of participating chefs will be revealed in February. For more information on the EAT! Vancouver Food + Cooking Festival or to stay up-to-date on the latest developments, go to www.eat-vancouver.com, become a fan of/eat.vancouver on Facebook or follow @eat_vancouver on Twitter, @eatvancouver on Instagram and /EATVancouverFestival on Youtube.